In these video tutorials is shown how to use the Unreal Engine 4 Sequencer and how to control sequences using Blueprints. 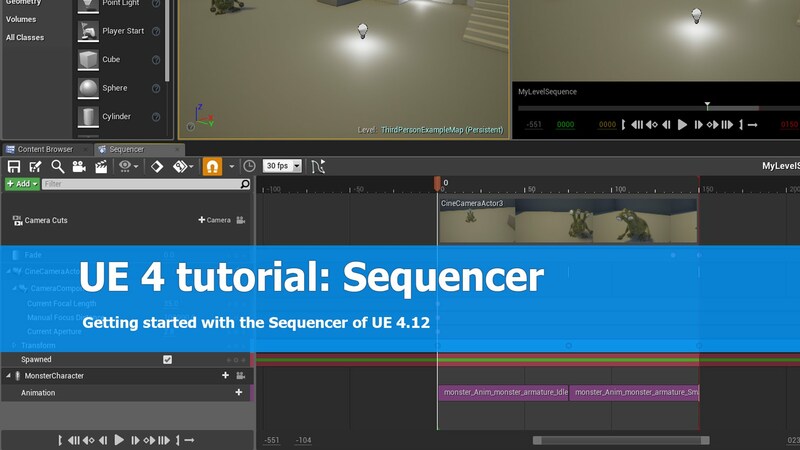 In this first video is explained how to get started with the Sequencer feature of Unreal Engine 4. A simple scene is setup and the camera is moved using the Sequencer with keyframes. When the camera reaches a certain position, an animation of a character is played in the sequencer’s timeline. In the second tutorial a cutscene is created and objects in the scene are animated by using automatic key frames with the Sequencer. An animation for a boat model is generated using this approach. The last video tutorial is about playing recorded sequences with blueprints. To do this, a reference to the sequence is defined in the blueprints and the blueprint node named Play for the sequence is called when the player is entering a box collision / trigger component. You can just follow along to get a basic understand on how to use the Unreal Engine 4 Sequencer to be able to create your own cinematic animated shorts.